Since Dominion’s release, many have been eager to capitalize on the deck-building phenomenon, but in every case, I’ve found myself cold toward the new and that much more impressed with the original. Ascension, for example, I thought was okay, but its twist (same cards each game/different order and two currencies) left me craving the more balanced approach of Dominion. Eminent Domain was kind of neat, but it lacked the variety (and thus replayability) of Dominion. Thunderstone was thematic, but its mechanics were bogged down by its theme, and games outlasted my interest. On and on. Arctic Scavengers is the newest in the line of Dominion followers, set in a post-apocalyptic wasteland of scarce resources and frightening possibilities. How does it stack up to the others? Find out below! 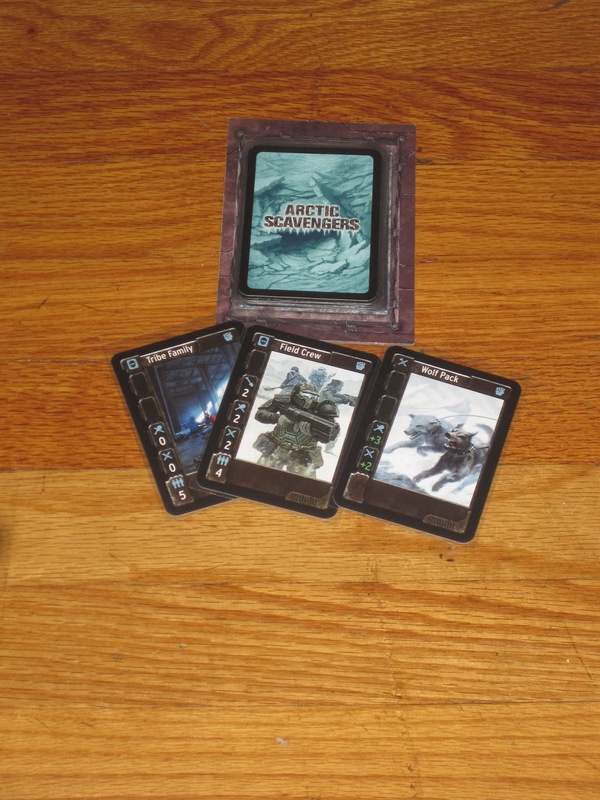 Arctic Scavengers is a deck-building/hand management game for two to five players set in a postapocalyptic world. Cards acquired during the game are added to the players’ personal decks, and each card generally has multiple uses. The player with the most tribe members when the contested resources stack is exhausted is the winner. At the start of the game, players shuffle the contested resources stack and the junkyard, and the mercenaries are placed in piles within easy reach of the players. 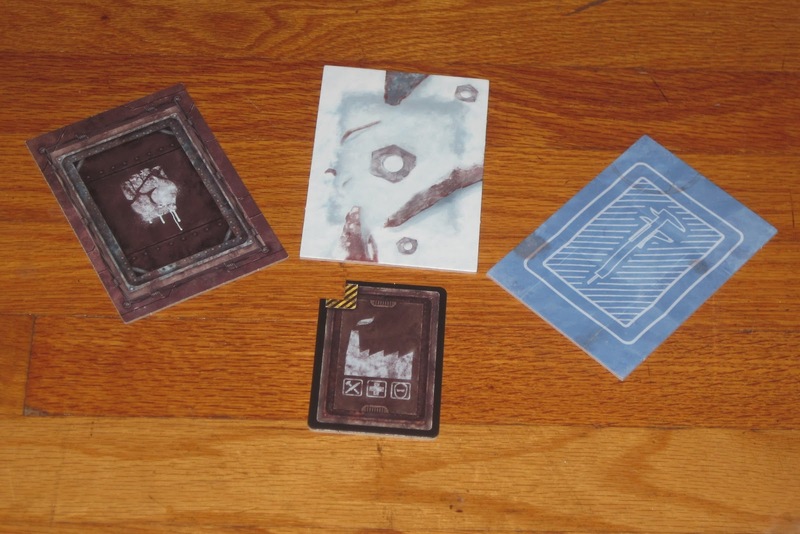 Each player begins with a deck of four refugees, three scavengers, one brawler, a shovel, and a spear. A round is divided into three phases: draw, gather resources, and skirmish. During the draw phase, each player draws a new hand of five cards, and the “initiator” (the start player) looks at the top card of the contested resources stack. During the skirmish phase, players compare their fight value with the other players’ fight values. The player with the highest value gets the top card of the contested resources stack, which generally includes either better cards during the game or high point value cards for the end of the game. After the skirmish for the last contested resource, the player with the most tribe members is the winner. Glorious Summer or Winter of Discontent? I mentioned at the start of this review that, while many games have claimed to be Dominion’s successor, I still prefer the original to all the others. But of all the other deck-building games I’ve played, Arctic Scavengers comes closest to unseating (but really, supplementing) Dominion. From reading the rulebook of Arctic Scavengers, the game seemed very similar to Dominion. There is drawing, trashing, “buying” (through hiring mercenaries). There’s a common pool of mercenaries to draw from. Players are somewhat limited on their turns, being able to perform each separate action only once. Most cards have multiple uses, and it’s easy to see at a glance what they do. Yet despite these similarities, Arctic Scavengers has a completely different feel from other deck builders, and especially Dominion. First of all, while Arctic Scavengers uses deck-building as its means to acquire and use cards, the game feels much closer to a hand management game. On each turn players have five cards in their hands, and between those five cards they must do the best that they can. Should they try to draw new cards from their decks to get better resources to use on this turn? Should they try for a big hiring turn, getting more powerful mercenaries for later use? Should they dig around in the junkyard for a useful tool? How much should they contribute to the skirmish? (And, further, is the contested resource worth fighting over?) In Dominion, players’ hands more often than not play themselves: the game is in determining which cards to place in your deck to lead to the better hands you want. 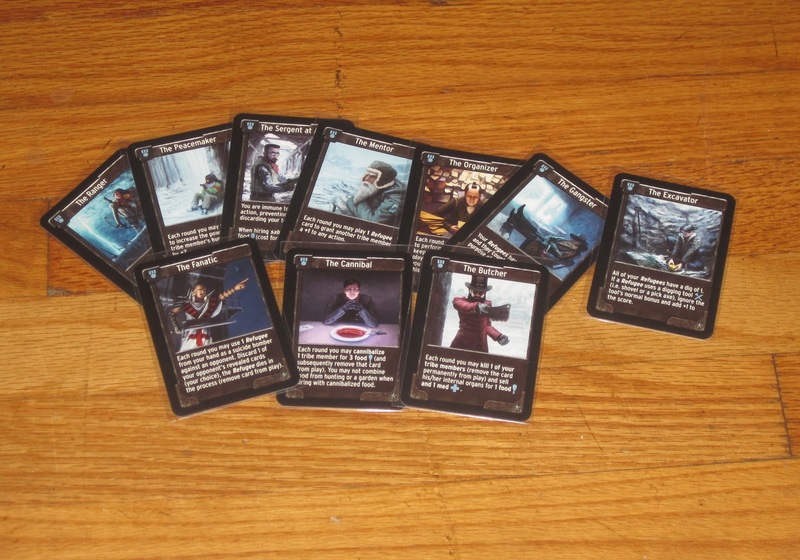 In Arctic Scavengers, while cards added to the deck are important, each card usually has multiple options, and the game is in leveraging the available options to produce the greatest effect. To this end, the card design in Arctic Scavengers is excellent. Taking a page from Race for the Galaxy, each card in Arctic Scavengers is laid out in such a way as to easily find the pertinent information. Fanning your hand of cards, you can tell at a glance how many cards you can draw, how good your digging might be, and so on. What could be a tedious process is made much better by the clear design of the cards. Arctic Scavengers revolves around the contested resources, and for good reason. Who doesn’t want Master Chief or a pack of wolves in their tribe? Arctic Scavengers also separates itself from Dominion in tone and feel. While theme is present in Dominion, it’s more felt in individual cards, rather than in a narrative arc. (“The bureaucrat clogs your next turn with useless cards–that makes sense!” “But why is there a bureaucrat in medieval times?” “…”) Arctic Scavengers feels like what it claims to be: a postapocalyptic war zone where players are desperately searching for the resources they need. Thus the “digging” through the junkyard, the hunting and trying to provide meds to hire mercenaries, and the meeting on the field of battle to fight for the best resources. It can be frustrating to commit your resources to futile pursuits, but it’s very thematic and one of the most fun aspects of the game–even when you’re the one who misses out. And despite trying to get the best stuff, the thing that matters at the end of the game is people: the player with the most tribe members is the winner. This brings some heart to an otherwise bleak game. The tribal leaders. Some are a bit…grisly. Arctic Scavengers further separates itself on the aggression front. While not as aggressive as, say, Nightfall, the game involves more than the equal-opportunity attacks of Dominion. Sniper teams and saboteurs target individual players, so spite can run high. Further, while the skirmish is essentially a blind bid for a resource, it feels much more aggressive than blind bidding for a painting in Modern Art. There can also be an element of bluffing here, which is new (in my mind) for a deck-building game. In one of the games I played, an opponent had a fairly worthless hand, but he committed everything to the skirmish. Another guy at the table, not to be outdone, committed his whole hand–which could have been used to better effect elsewhere. He won easily, but the first player got a good laugh from his successful bluff. I like that so much of the action in Arctic Scavengers is secretive. It makes sense that in a sparsely populated future, other tribes wouldn’t know exactly what I’m doing until I show up on the field of battle. So it’s cool that cards viewed and gained from the junkyard may be kept secret. Similarly, while everyone shows up to the skirmish knowing that the contested resource is probably awesome, only the start player knows what it is. After the skirmish, only the start player and the skirmish winner know what it is until it shows up later. Trashed cards are added to the bottom of the junkyard sight unseen. Cards added to buildings (if the expansion is used) are added secretly. Snipers and saboteurs can strike at any time, from hand or skirmish pile. I love this aspect of the game because it keeps players guessing the whole way through (especially if the “gangs” module is added from the expansion). The insert is nice and keeps cards and stacks separated. However, among these positives, there are several things that temper my opinion of the game. For starters, the game is slower than Dominion because of the multiple uses for cards. Especially with AP-prone players, game turns can take longer than I typically like. It also takes a while to set up/tear down, especially with the junkyard and other piles, depending on whether expansions are used. (This is no faster or slower than other deck builders, really.) And because Arctic Scavengers is more thematic, it’s also a little fiddly, especially when teaching the rules: each means of acquiring cards has a little bit different rules. These rules aren’t hard to master, but it makes the game a little more complicated than “gateway” fare. Also, while the contested resources is an excellent and fun twist, it can lead to a runaway leader problem. Most of the cards in the contested resources stack are well suited to fighting in the skirmish, so players who win often will be handed the best cards to help them win more, and so on. This can be overcome somewhat with saboteurs and snipers, and by hiring some of the high-cost mercenaries, but defeating the king of the hill is difficult. Along these lines, some of the tribal leaders are significantly better than others, which can give players who draft them an early advantage. In one game a player was The Butcher, who could remove a tribe member from the game for one food and one med. He thus had access to mercenaries that required meds before any of the rest of us did, which offered him an early advantage in the skirmish, which kept him going for the rest of the game. The rules provide for a leader draft, which mitigates this somewhat, but players should watch out for the powerful tribal leaders. With sleeves (and even without) the box doesn’t close like it should. 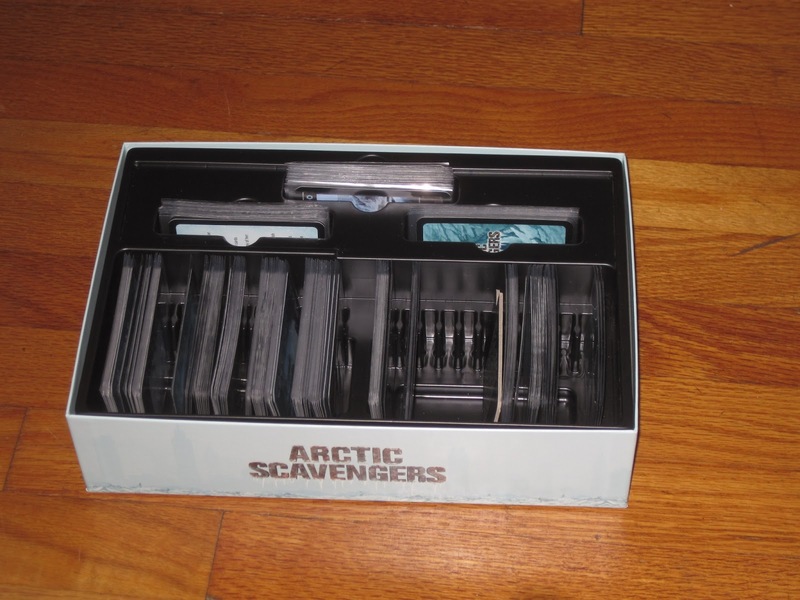 Arctic Scavengers may also be lacking in the replayability department for some players. Most cards are available every game, and the contested resource pile, aside from order, is the same every game. Thankfully, the expansion modules should give the game extra mileage. I especially like the gangs and tribal leaders modules, but I found the buildings, while an interesting concept, to lack usefulness in most situations (outside of securing the Masons gang). 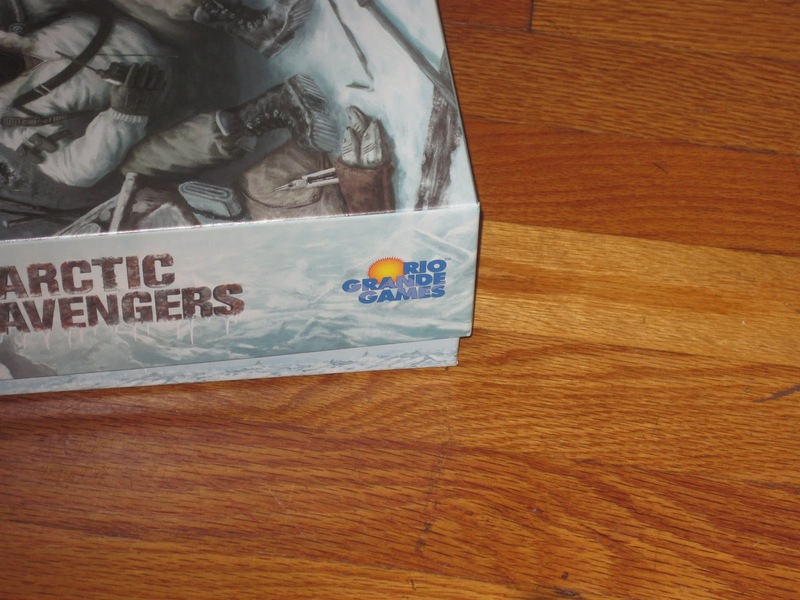 The components in Arctic Scavengers are good. The art style is thematic and consistent (although, again, a bit grisly in some cases), the included mats are thick and helpful (though the rules summary is a bit big to be useful during the game), and I like that the cards are the standard US size because there are more sleeve options available. However, after sleeving the cards, the box no longer closes properly. (Indeed, if you want to keep the playmats above the insert, the box doesn’t close before sleeving.) In deck builders sleeving is especially important, so the fact that the box doesn’t close is disappointing to me. The rulebook also has some ambiguities, though the designer has been very responsive on the Board Game Geek threads, and most users had already asked the questions that came up. All told, Arctic Scavengers does not replace Dominion for me (is such a thing possible? ), but it does supplement it because it’s an interesting deviation. What is somewhat ironic is that while the game is closer in rules to Dominion than any other deck builder I’ve played, it also feels the most fresh. I love the backstory, the tone of the game, and the way the mechanics mirror the theme without bogging the game down in exception after exception. I love the hand management aspect, the secrecy, the bluffing, the bidding. Arctic Scavengers is not as elegant as Dominion, but it has proven to be a fun (and requested) lunchtime choice. 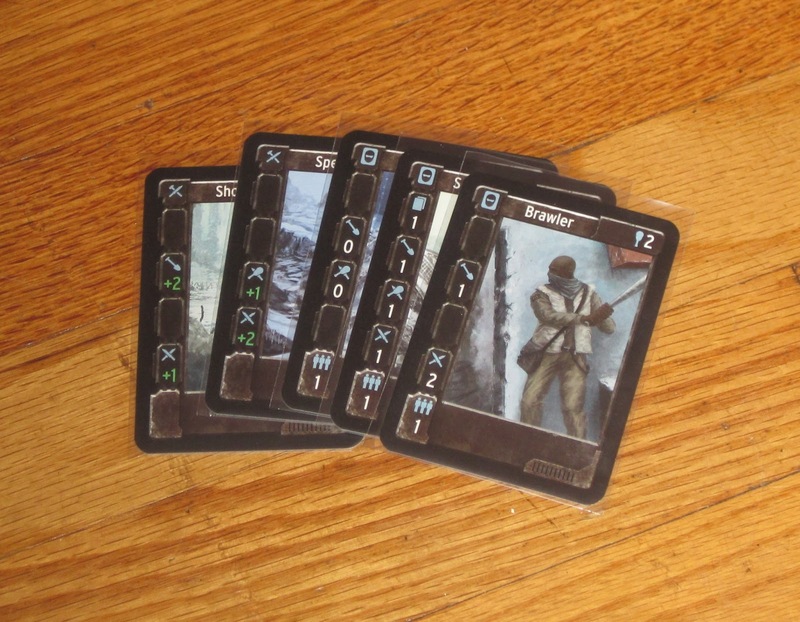 If you want a little more aggression and theme from your deck builder, I heartily recommend Arctic Scavengers. 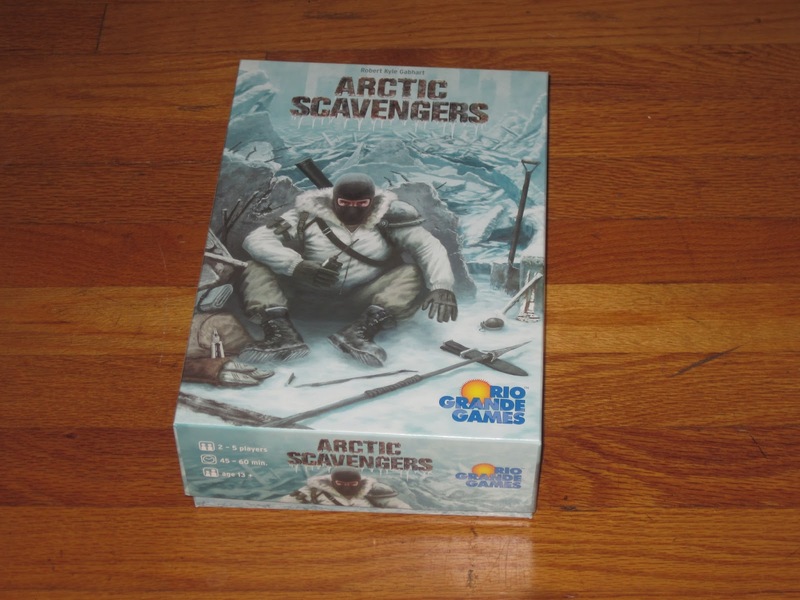 iSlaytheDragon would like to thank Rio Grande Games for providing us with a review copy of Arctic Scavengers.